I sketched this morning in Woodinville at the pioneer cemetery where my great-grandparents and other Ormbrek family are buried. This was the first time I was able to enter the cemetery and stand at the foot of grave of the Norwegian immigrant who raised my dad together with her ten children. 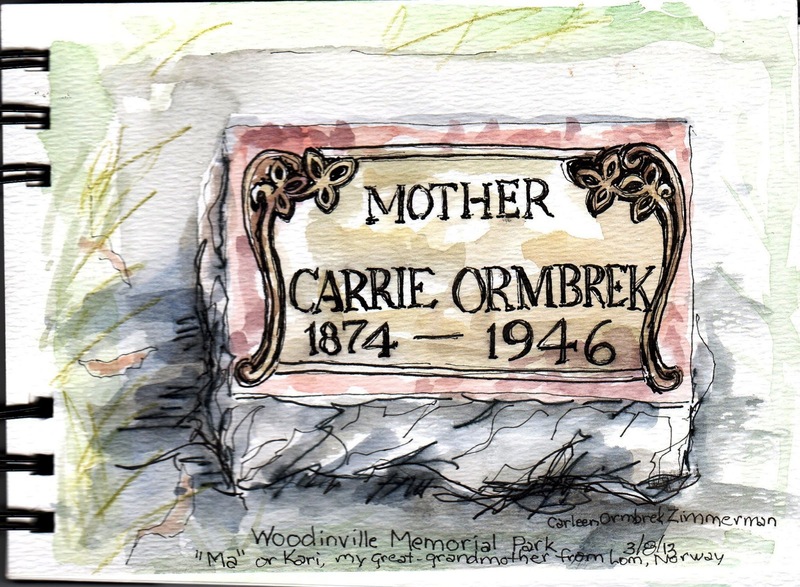 The Ormbrek homestead lies now where Woodinville Town Center is. grave of Kari Fosberg Ormbrek, born in Lom, Norway, oldest of five daughters and three sons, came to Norway at age 19. 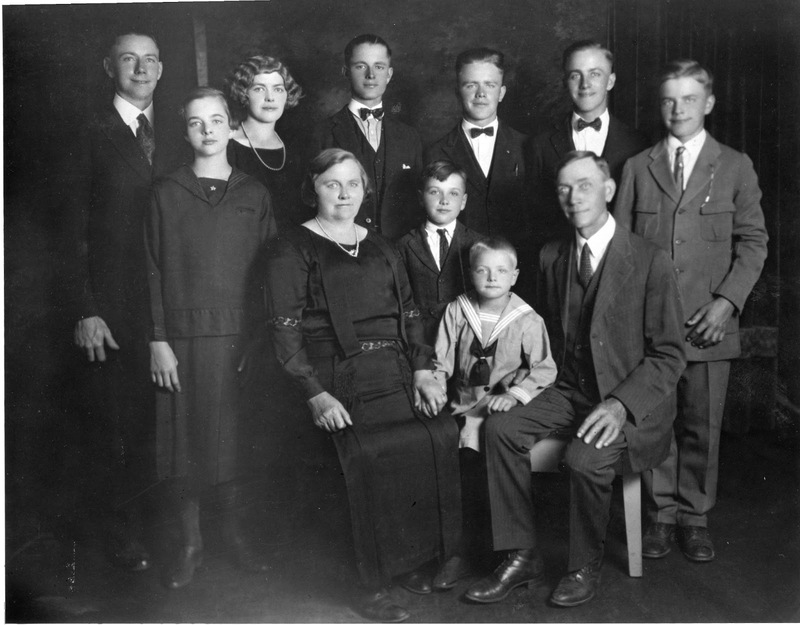 Photo taken in 1925, the year my dad was born, Kari and Gunnleik and nine of their ten children. 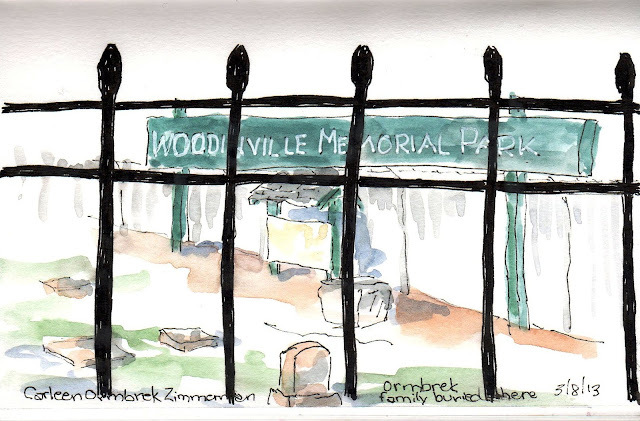 Son Fritz, buried in Woodinville Cemetery, had already died 1919. We have been members of the Sammamish Valley Pioneer Association for many years.Sketch challenges were cold temperatures, not having my stool to sit or put my paint pallet on, dog walkers wondering what I was doing, cold temperatures, forgetting my gloves...and numb fingers. "Farvel, oldemor! Takk for alt!" Carleen, what roots you have! Your post tells a great story. Wonderful sketches and accompanying stories, Carleen! Thanks Kate and Tina. I neglected to mention that the cemetery sits next to some industrial buildings on NE 175th street in downtown Woodinville just a few blocks to the west of Molbak's. For years it was only open once a year. My dad showed me the Ormbrek plot a long time ago as we stood outside the chain link fence. The city has since taken down that fence and the laurel hedges. There is a new iron fence and two gates allowing visitors to enter. It is amazing to see how urban development continues to explode around this quiet spot with whispers of family histories. There is an Ombrek street in Bothell. I wonder if they are related.